Halifax will host Super League outfit Widnes in the sixth round of the Challenge Cup. Fax, easy 80-4 winners over Conference amateurs Lock Lane last weekend, were paired with Denis Betts’ Vikings, who set the early pace in Super League this season, in today’s draw. The fixture, which will be played on the weekend of May 8, is a repeat of last season’s Super 8s Qualifiers game at the Shay, which the Vikings eventually won 14-0, although Fax were within a score until the final minutes. The teams also met in pre-season in January, with Fax coming back from 18-0 down to draw 18-18 in Cheshire. 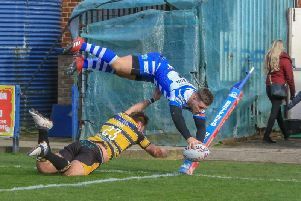 “It’s an exciting one for us,” said Fax boss Richard Marshall. “We’ve got some learned experience against Widnes from playing them a couple of times recently, but if we’re honest I think they’ve improved this season.